Emotional Intelligence is quite the buzz word lately and I’m excited to learn that EQ is beginning to even make it into the classrooms of public schools. With EQ being part of children’s curriculum I’m wondering where adults are making it a priority in their own lives and what are the benefits of having a high EQ? Sounds like a good thing to develop right? While some work places are creating in- services to help adults develop this self awareness around emotions, today’s adults may be lagging behind on what kids today are learning in elementary school. What can bridge the gap? As a sound healer and soul singer I have found that developing vocal awareness assists people in developing self awareness, self compassion and a higher EQ. Using your voice to express complicated patterns of emotion from childhood allows the individual to deepen their listening skills, to create acute self awareness and to release the energetic of the emotion so it is no longer something the individual reacts to. It seems to me that the reactivity to something from the past is what can plummet EQ rather then responding from the present moment. One’s own voice can begin to assist the individual in becoming more present and create space between a feeling and a reaction. Learning to respond to oneself with patience, kindness and empathy gives them the ability to respond to others in a similar way; at least this is the way I see it. I see it like this. Emotions are an energy that flow through the open flute of a human. Keeping energy flowing like water through the open flute, lets a person process the feeling and emotion and come back to center. When events happen too quickly for a person to process (time to process is individual to each person) there becomes a clog, the energy instead moves like tar instead of water. Left alone with out attention the energy of the emotion densifies even more and the person can feel a physical tension in their body. Even worse the person can start identifying with the reaction thinking this is just “them”. One can be taught to tune into all these energetics, learn to hear it and put a vocal sound to it to get the energy flowing like water again. Sometimes the past stories surface and sometimes they don’t. There is nothing to conversationally process unless the person feels like it. This vocalizing technique works brilliantly for some folks to build that self awareness that leads to a higher EQ. Sound is vibrational energy. Your voice is vibrational energy. Your emotions are vibrational energy. Have you ever used electric stimulation at a Physical Therapist’s office? This is vibrational energy as well, used to heal, and shift a body into a more optimal state of being. 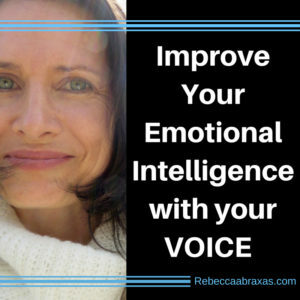 It is my belief that one’s voice can do a similar process for one’s emotions from past or present. Emotions are a frequency that give us information. When we use that information and put it through the voice we gain awareness and are able to process the emotions so we don’t have to react from them. If you have not tried this before or feel inhibited to do so, I encourage you to be brave and play with this process. Of coarse this doesn’t mean ignore professional help, but what if this could be a complimentary support? Curious about Vocal Sound Healing and Soul Singing? Feel free to comment or post questions below! The Gift of Be Here Now Is Your Mind Getting in the Way of Your Bliss?